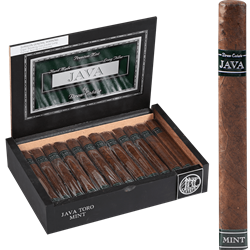 The sensational Java By Drew Estate Mint Toro is a medium-bodied, small batch production of first-rate Nicaraguan long fillers and binder. This premium cigar is uniquely infused with the rich flavors of cocoa and espresso. Java Mint blends a rich cocoa flavor with hints of mint and vanilla. A Rocky Patel and Drew Estate special collaboration that will leave you wanting to try all of the flavors we offer!